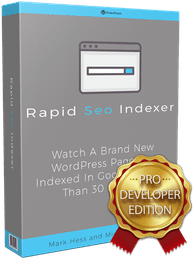 Unlimited Developer Rights + Make Money With Rapid SEO Indexer Get instant access to the Unlimited Developer Pro version of Rapid SEO Indexer. Install On Sites You Build For Clients– Your existing clients will thank you and you can even charge extra. If you're looking to get new clients and website projects, you can tell them your bid also includes premium plugins. This gives you an advantage. Include Rapid SEO Indexer With Sites You Flip – The person who purchases your site will still have access to the plugin and don't need to purchase a license of their own. Plus, when you list your website, you can mention that there's premium plugins installed to get higher bids. Make Money By Offering Installation As A Standalone Service – Some people are going to make a lot of money with this plugin. Offer plugin installation service on sites like Fiverr, forums, or any other freelancing site.